For years the word magician conjured up thoughts of rabbits from hats, balloon animals and basically...Cheese! 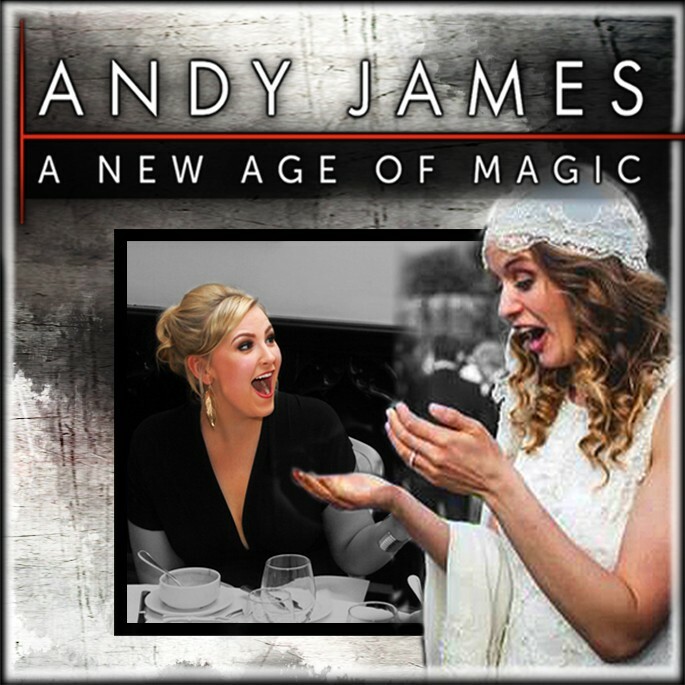 Andy is among the new breed of modern, entertaining and unique magic performers. Creating miracles in the hands and minds of your guests. It really is something your guests will never forget. A Wedding is one of the most amazing days in a lifetime, for guests, family and the lucky couple. Andy specialises in Up-Close Mindreading and Magic, your friends and relatives will share laughs and gasps during his performance. Minds will be hacked! Coins will bend, fire will transform into ice and a deck of cards will morph into a solid block of glass (right in their hands!) It’s great fun, involving and amazing. Andy has a few different options of how to really make your day unique and memorable. Check now to see if Andy is available to add that something special to your MAGICAL DAY. 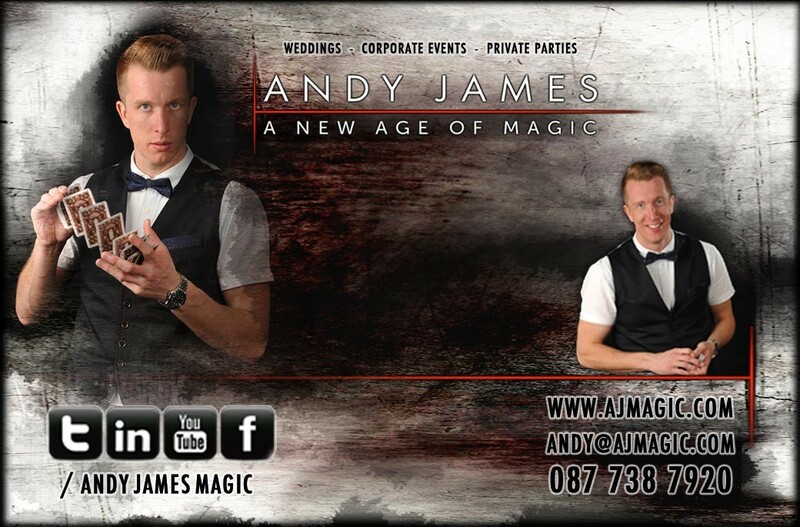 Andy James - Magician is a magician from Dublin servicing weddings throughout the local area including Dublin Kildare Meath Wicklow Louth Carlow Wexford Kilkenny Offaly Westmeath Cavan and all over ireland. 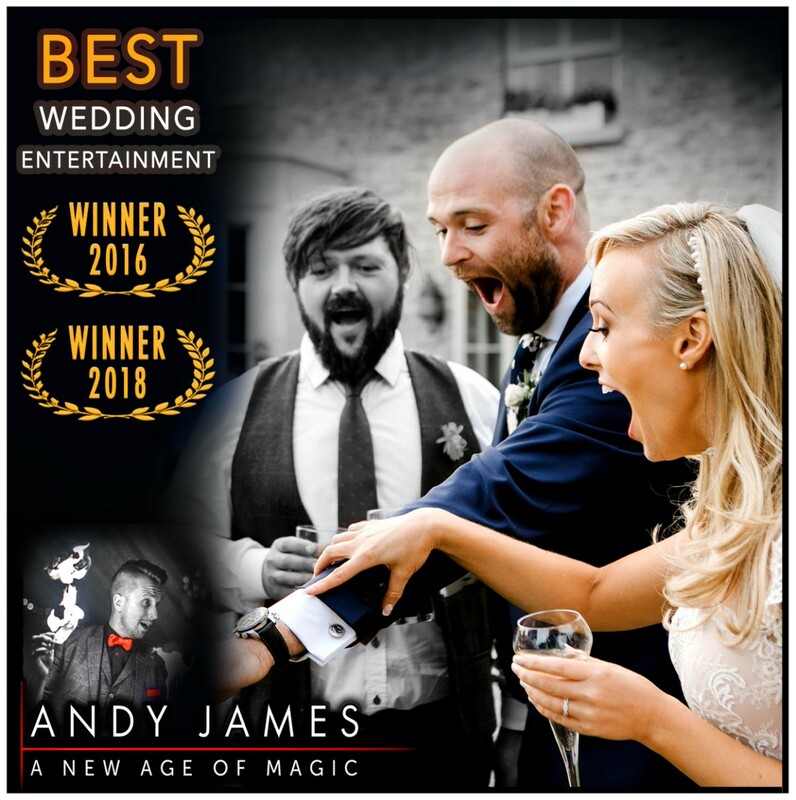 Andy James - Magician is a AMAZING Magician that has been part of the Wedding industry for over 15 years specialising in Wedding Entertainment & Magic in Ireland. Andy is fantastic. Excellent at what he does and extremely personable. He made our wedding day and we can't thank him enough. Andy was absolutely brilliant- all the guest loved him. One of the highlights of the day. We had Andy for the evening part of our wedding on the 1st of September 2018. He started just after the main course and did some tricks at the top table first and got in a few more tables also before the speeches. He then went around to the rest of the tables whilst our band was setting up and continued also for awhile afters. I cannot recommend Andy enough, he was absolutely brilliant. He seemed to make it around to nearly all our guests and they are still talking about him a few days later. He kept everybody from young to old entertained. He is 100% worth the money and really added to our wedding day???? Everyone at our wedding seemed to have a story about Andy, he's amazing. He had everyone puzzled and brought great craic to the day. He's a great showman, very charismatic and a real charmer. He performed just for the bridal party too which was a great touch. We had him at the drinks reception, well worth the money! If anyone is considering Andy and is unsure, book him and you will not be disappointed. He was amazing at entertaining our guests in between the ceremony and dinner and our guests still talk about how good he was months after the wedding. 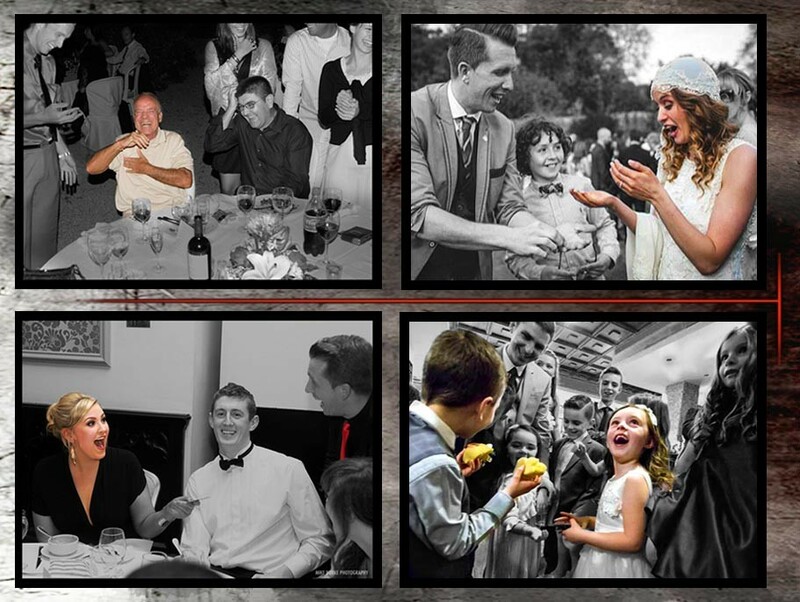 Our photos with the guests reactions are so lovely to look back on and it really shows the atmosphere Andy creates. We had Andy perform at our wedding last weekend 12/05/18 and I could not wait to write this review for him because he was amazing! Anyone here considering booking him do not hesitate for one minute he is worth every cent. Our guests were amazed and howled with laughter. The man is a genius, his acts are mind boggling and the way he mingled with our guests was so professional. I found him so easy to deal with from the day we booked him. Thank you Andy so much you were one of the big highlights of our day! ???? I have to say that Andy was amazing. From the minute he arrived all the guest gathered around and were completely in awe. No one knew how he was doing all the tricks and the reactions that everyone had were fantastic. We cannot wait for our wedding video!! I had so many people asking for his details he was a massive hit! A true gent and amazing performer who knows how to have the craic and play to the crowd. Thank you so much Denise and David Gill. Andy was an amazing asset to have at our wedding. he was professional to deal with in advance and mind blowing on the day. we were both thrilled with our decision to include Andy in our day. Andy was the first supplier we booked for our wedding in October & he exceeded all expectations. Andy had all our guests talking about his tricks in the weeks after the wedding they were all so impressed. We booked Andy for the drinks reception & for after the dinner which was fantastic value for all the entertainment he provided. It was great to arrive at the drinks reception to see so many guests around in little groups watching his tricks & getting people to mix, it was a real ice breaker. Likewise to see Andy spend time entertaining the top table after dinner was great & had us all amazed! He went around too all the tables and had all the guests entertained and laughing including the grannies which made the time fly as the band set up. 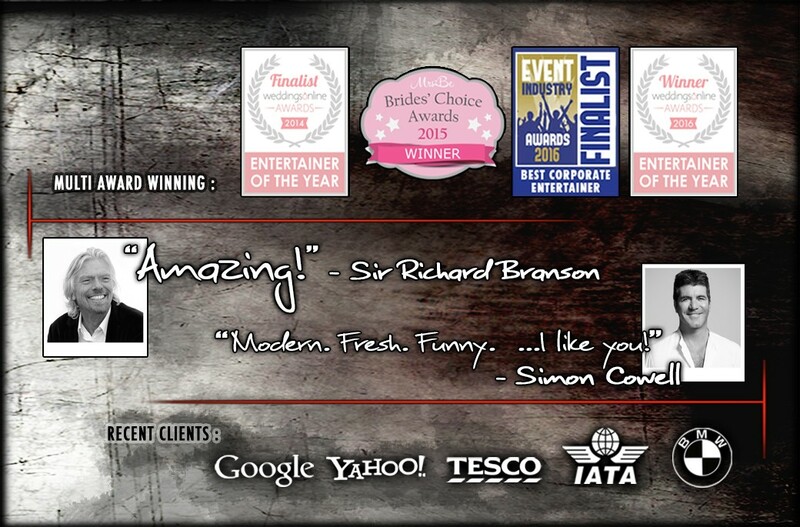 Overall a top class entertainer and a complete gentleman, If you book Andy you wont regret it. What a night! Andy was fabulous. He started just after dinner and had everyone scratching their heads in amazement. People were still talking about him hours later, including our Spanish guests whom he conversed with in Spanish! Thanks for helping to make it a special night Andy. Andy really added a very special touch to our day. Our wedding was a small family day in our favourite restaurant. Andy entertained our guests so well and people are still talking about him. Amazing close up magic and a really nice guy. We got a bit delayed in starting our meal so the timelines went a bit off but honestly Andy just rolled with it and was so pleasant. He includes everyone from the youngest to the oldest and was great fun. 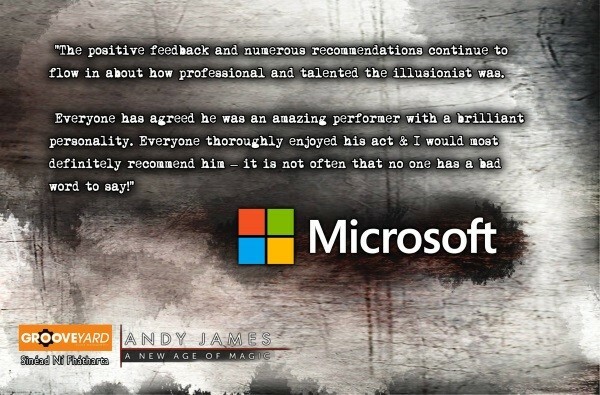 We would highly recommend Andy. Andy is absolutely astonishing, our guests are still talking about him months afterwards. He had everyone in the room captivated. One of the best decisions we made for our day was booking Andy, and he’s a complete gentleman too! Andy was by far and away one of the best decisions we made when booking our wedding! His presence and talent absolutely light up the room and draw everyone in! My new husband and his work colleagues are particularly freaked out by Andy's talent- "How did he do that!?" was asked many times!! We're so delighted that we were lucky enough to have Andy as part of our wedding and can't wait to see him performing somewhere soon!! Andy really entertained everbody on the day, but in a dedicated and unobtrusive way. He made sure to get around to each individual which was really appreciated! 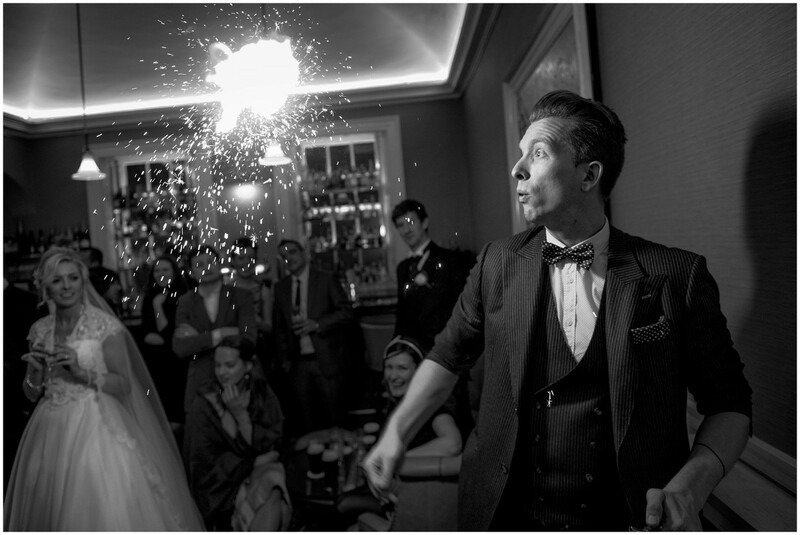 Andy blew the lights out at our wedding in the Cliff Townhouse in May 2017! Everybody was raving about how good he was and I am still telling people about some of the tricks - no idea how they were done! He worked the room very well and managed to do something for almost every group, very professional. From start to finish m for magic a for amazing g for great i for imaginative and c for convincing true magic at it's best thanks Andy. When we first had the pleasure of seeing Andy at a work party in 2015 we knew we had to have him at our wedding! The booking process was very straight forward with the lovely Andy and there is very minimal effort needed from the B&G (which is great!) We got married in December in Donegal and Andy made the day so memorable. We booked the four hour package which included networking before dinner and a special magical show after dinner. He had our guests in stitches laughing one minute and then in awe the next! We had a mix of all ages/cultures at our wedding and Andy tailored his act depending on who he was talking with at that time. We found that having Andy preform before the speeches really warmed up the crowd and took a lot of pressure off the speakers. He really made the day so memorable and our guests were talking about his show for weeks afterwards (amazing sign!). Andy is wonderful to deal with and a true gentleman. If you are looking for that something special on your wedding day, I would not hesitate to book Andy! I can promise you, you won't regret it! Absolutely made the day!! ... Andy was the talking point for weeks and months after the wedding day had long past!! Can’t recommend him enough and can’t wait to see him at a wedding we attend! Top class!!! Choosing Andy for our wedding reception was the best decision we ever made. He was fantastic, such a great hit with the adults and kids. He really made the day so fun and memorable and he got around to every group of people with something different each time. I would highly recommend Andy, he is great fun, has a great personality and brilliant at his job. Our guests are still talking about him today and we can't wait to see him performing again soon. Got Andy for our wedding. Made the day, our guests loved him and he created a buzz for the whole day. Money well spent still can't work out how he pulls off those tricks. Everyone is still talking about him. Perfect for a wedding or party. Would highly recommend Andy for anyone who wants to have their guests entertained. Andy James we are still amazed months later. One of the best decisions we made about our wedding, cannot recommend Andy highly enough. It created such a buzz and excitement at our wedding for young, old and everyone in between. Some of the best pictures we got were from people's reactions to Andy's tricks, thanks Andy. I Think this Man Was amazing he kept Adults and children amazed for quite a while I would recommend him to anyone i know. Great value for your money too! We had Andy for up close after dinner magic with our guests. He was amazing and blew our guests minds..they still talk about his amazing tricks. Andy is such a lovely guy, very funny so brought the comedy factor with him. We had him booked for a couple of hours after the meal but he mingled with guests ensuring the all got to have the pleasure of seeing his work. Very talented very professional. .definitely the best money! Absolute fabulous entertainer. Still can't figure out how he did the tricks. Engaged with everyone that was there and we certainly weren't bored. The best money i spend on our money. Every guest at the wedding loved him . All I can say about Andy is he's Amazing, not only on the day but also to deal with. He was very fast to respond and very helpful. Andy entertained our guest while we waited for the band to set up. Which was a great idea as he really got the party started. All our guests loved him. He really helped add a bit of Magic to our day. Andy is a true professional. He provided that something extra to our day to make it very special. Normally people talk about the band, weather, food etc afterward but everyone has discussing Andy and how amazing he was at our drinks reception. Since our wedding i have received a number of calls from guests at our wedding to get his number and i know he has been booked by all of them for various events. We cant recommend him enough. He is a must have at any wedding! 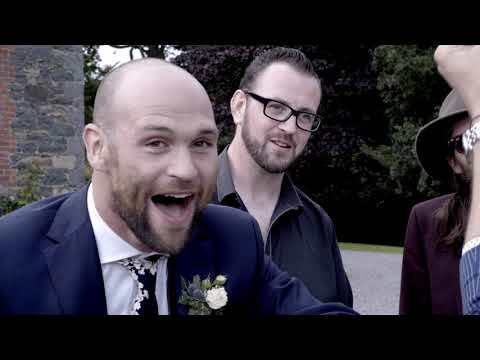 I had Andy James at my wedding on the 3rd July, and it was the best money I ever spent I didn't have a band so I wanted something different so he entertained the guests while we were getting photos I also had him for after the meal for stand up magic act well it's was brilliant people still talking about it! My son is 7 and he couldn't of done enough for him on the day! An amazing addition to our day. So courteous to deal with and an absolutely amazing performer. No idea how he does it! People are still talking about him. Unreal performer. Such a lovely man to deal with. Had all the guests talking about him after the wedding. Definitely the best I have ever seen. Cant recommend him enough. Andy was extremely professional. All our guests were amazed by him on our big day! Almost a year later they still talk about some of the tricks he did on the day. He blended into the crowd so easily and we really were delighted with the service he provided. I have to honestly say Andy was AMAZING one of the most memorable parts of our day. Everyone was amazed by him! . He mingled fantastically with young and old, the kids all want to be magicians now! Everyone got to see him perform which was fantastic. We had fabulous feedback from all our guests and I would love to go and see him again. Myself and my husband & family still talk together about some of the tricks he performed and how he possibly could of done them. I would definitely recommend everyone to book him - he wowed everyone and will be forever one of the greatest memories of our big day! Myself and my new husband Declan had Andy perform at our wedding in September this year. 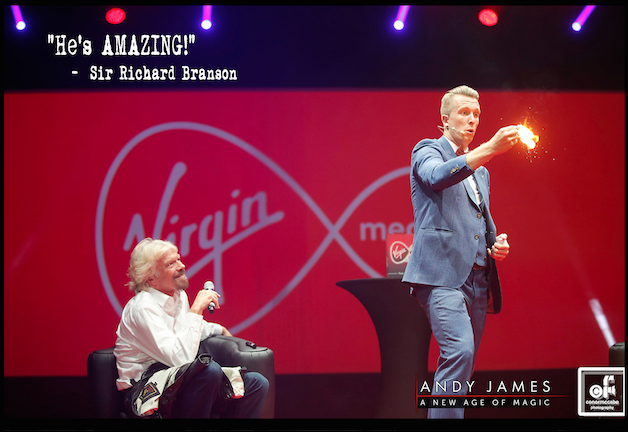 We were overjoyed at the reaction of our guests to Andy's performance, so many of them commented on how much they enjoyed his tricks and he truly entertained them. The drinks reception can sometimes be a lull in the day but not when Andy is around. We would definitely recommend Andy to other couples planning their wedding. 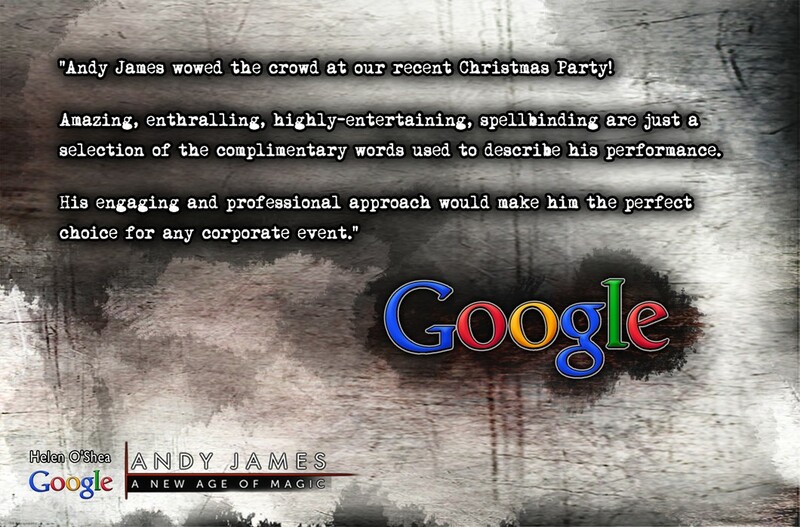 Simply amazing ,, Andy wowed our guests to the point that some of them then went online to goggle how he bent the coin... But his secret is safe ???? From the moment we booked Andy we knew it was the best choice for the few hours spend before the wedding dinner. Our guests loved his very casual but professional approach. To the point that when he moved around threw the guest they were following him. He even went as far as leaving a fantastic surprise for my self and husband when the day was all over. He is a must for anybody's day. My friends are contacting me for his details for there weddings and birthday events. He is Such a nice guy. Thanks again my pictures would not have been the same without you. Hi Andy Just wanted to thank you again for the fantastic entertainment at our wedding. It really set the evening off and had everyone in great mood, everyone was amazed (all ages) and are still commenting on how brilliant you were. Thanks again. Hi Andy Just wanted to say thanks for everything on Saturday. Every one thought your show was brilliant. People are still amazed by some of your tricks. You helped Make it a great night. Best of luck for the future. "An amazing performance. Even now guests are asking me how you managed to get their card on the hall ceiling. It must be over 30 feet high. Incredible." 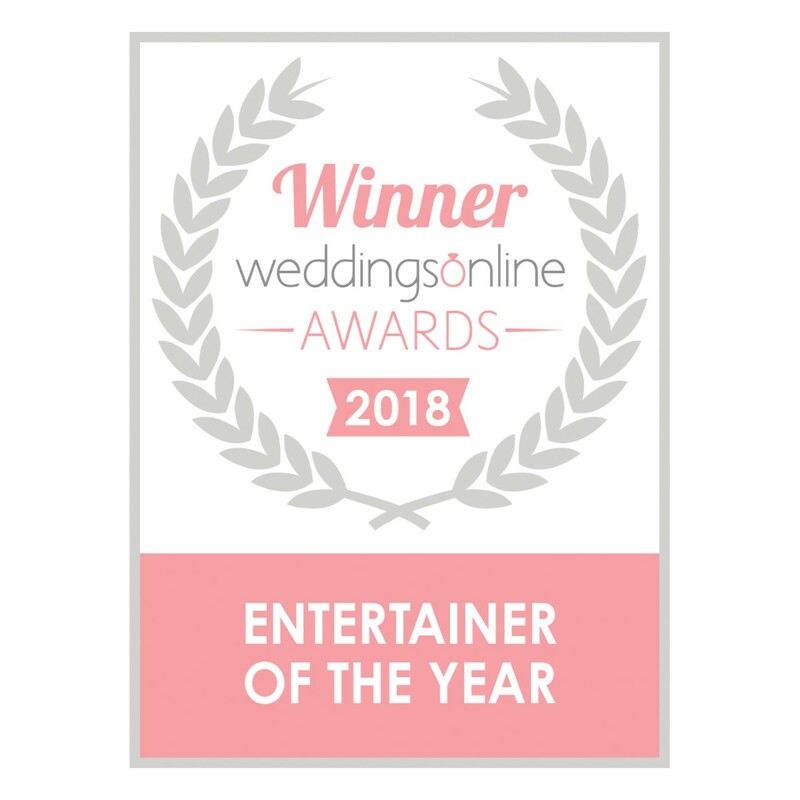 Winners of the weddingsonline Awards 2018 announced!